Yes, even though I’m an apostate Jew, I still like a few Christmas songs, and I’ve put them below to celebrate the beginning of my personal holiday. All three songs were written fairly recently—since 1962. This is a lovely one by Sarah McLachlan and a children’s chorus; it even includes an antiwar message, included in the original song written by John Lennon and Yoko Ono. That was recorded in 1971 by the John & Yoko/Plastic Ono Band with the Harlem Community Choir. I like this version because it shows the song being recorded. Who could forget Karen Carpenter, to my mind the possessor of the world’s best female pop voice? And this is her most famous holiday song, written by her brother Richard and Frank Pooler and recorded in 1970. She’s already anorexic in this video, but the voice (prerecorded) is strong—and gorgeous. Richard called her low notes “the money notes”: the word “Christmas” is one. And the owner of the world’s best male singing voice, with one of my favorite Christmas songs (yes, it refers to baby Jesus). The song was written only in 1962—as peace song during the tensions of the Cuban Missile Crisis. (The Carpenters’ version is here, with Karen coming in at 0:55). This entry was written by whyevolutionistrue and posted on December 25, 2018 at 9:00 am and filed under holidays, music. Bookmark the permalink. Follow any comments here with the RSS feed for this post. Both comments and trackbacks are currently closed. The Johnny Mathis version of Do You Hear What I Hear becomes surreal menace in Gremlins. And yes, I admit it, I like Paul McCartney’s Wonderful Christmas Time. Also, J. J. Ryba’s Christmas mass, “Hej mistre” (imagine a hacek over the “r” in mistre and the “c” in hacek). My wife, the feminist, loves Santa Baby by Eartha Kitt. Well-known feminist Miley Cyrus appears to have given Santa Baby a feminist update. I haven’t bothered to listen to it. It’s worth a listen. She has a great voice, and it is funny. Yeah, it made me laugh. I second that. After Ms Kitt’s Santa Baby, my favorite Xmas listening is on Jethro Tull’s Christmas album, which contains jazzed instrumental versions of God Rest Ye Merry, Gentlemen, Greensleeves and We Three Kings. Damn straight, Eartha Kitt. It don’t mean a thing if it ain’t got that schwing! Even though an atheist, my favorite Christmas music is Handel’s Messiah, and I am in awe to know that he wrote this magnificent piece in two weeks. Yes in two weeks, but he had the advantage of borrowing from some of his earlier choral and orchestral works. I am compelled to recommend Bach’s Christmas Oratorio. Favorite parts : glorious first track, Part 2 Sinfonia – has a subtitle, something about sheep , … not sure if “Sheep May Safely Graze” – another beautiful piece – is part of that. St. Johannes Passion – Christmasy? Not sure – opening song evokes deep pain, nails through flesh, (John Eliot Gardner said that), demons. Rare sounds for Bach. If interested check out A Passionate Life on YouTube. Perfect BBC viewing for December in the northern hemisphere. I am listening to Bach’s Oratorio as I write. Another Christmas masterpiece. One of the few things for which I am thankful to Christianity is that inspired some fine music and art. I actually play the Christmas Oratorio – and any Bach – all year. I have also been told by my vocal teacher (who I regard as an authority on that period of music history) that Handel was an agnostic/atheist. Made me feel a bit better about singing in a performance of “Messiah” this year! 1. The children’s choir / chorus (I think Lennon’s used a non-pro “chorus”) is the real heartstring puller here, for me. I’ll have to put it in the rotation. 3. Agree 100%. The call-response element of the “do you hear what I hear lyric” really helps set the song up. also needs to be in my rotation. Gotta admit, Mariah Carey All I Want for Christmas is You is pretty great. But I am heartily sick of hearing it. Thank you for this post. Happy holiday! Those Christmas songs will go well with your Chinese food tonight, PCC. 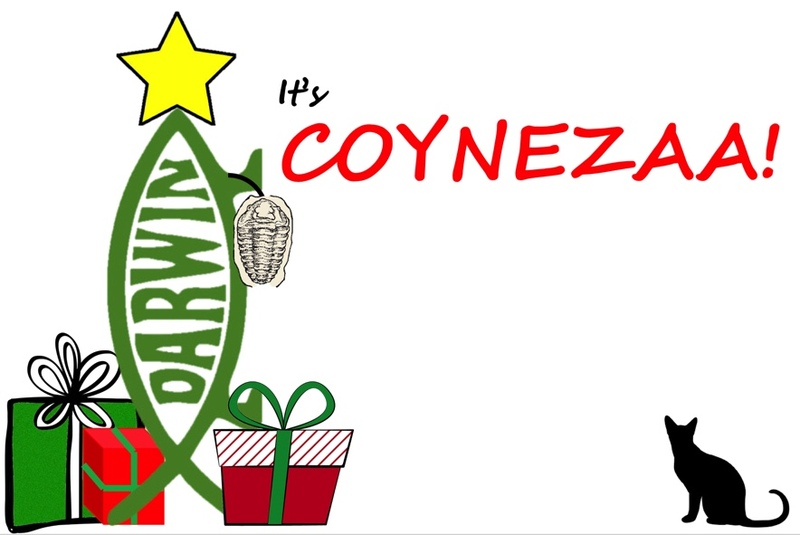 Happy Coynezaa! For a fun Christmas song, try “Christmas Wrapping” by The Waitresses. I saw them live a couple of times and they put on a good show. In addition to ELP’s “I Believe in Father Christmas” (which I posted about on FB just to see how many of my Christian friends actually listened to the lyrics) many of my favorites come from “Mr. Hankey’s Christmas Classics” on “South Park”, including the immortal “Merry F**king Christmas”, “Christmas Time in Hell” and (best of all) “The Most Offensive Song Ever”. Favorite Christmas novelty song: “Snoopy’s Christmas” by the Royal Guardsman. That’s too similar to “Little Deuce Coupe” for my tsste. In fact, it’s almost the same song! I find most Christmas carols rather dreary. Silent Night is a possible exception. I don’t mind Boney M’s ‘Mary’s Boy Child’ – a good reggae beat will make almost any tune upbeat. I just mentally pipe the lyrics to /dev/null and listen to the tune. If Xtianity consisted entirely of listening to Boney M I could almost tolerate it. I agree about Johnny Mathis though I prefer his ‘Island in the Sun’. But – no disparagement of Karen Carpenter intended – I think the world’s best female pop voice has to be Linda Ronstadt. Let me put in a word for two or three of the carols written by Alfred Burt back in the 1950s. I am surprised that no-one has mentioned my favourite: White Wine in the Sun, either the original by its author Tim Minchin, or the version by Kate Miller-Heidke accompanied by her husband on guitar. Both are on Youtube.